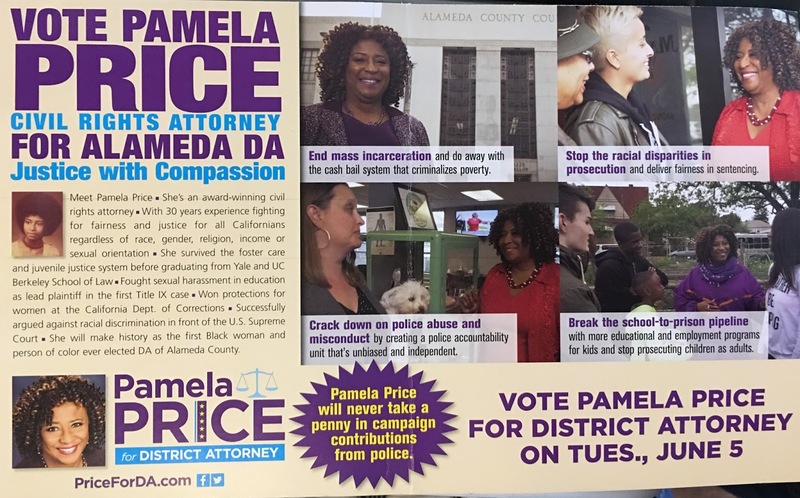 A large-size mailer sent late last week by Alameda County District Attorney candidate Pamela Price calls her opponent, incumbent Nancy O’Malley, corrupt. 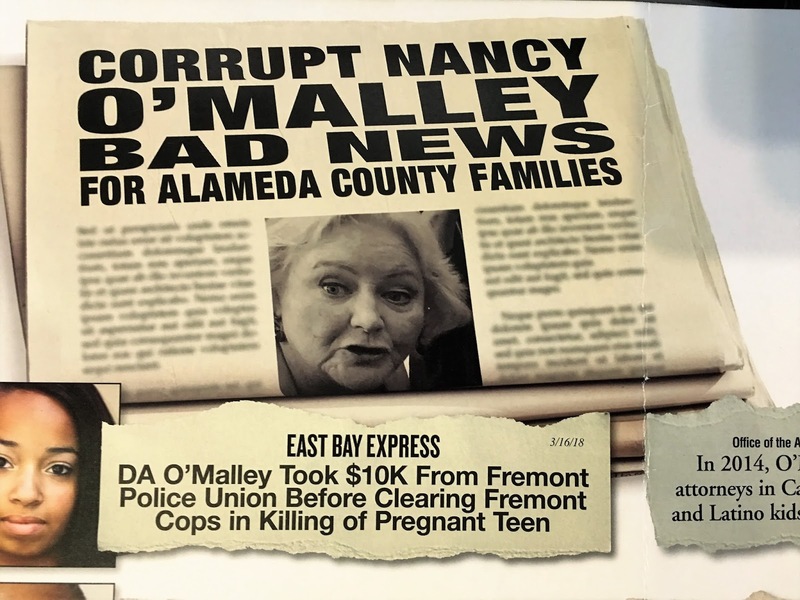 “Corrupt Nancy O’Malley bad news for Alameda County families,” blares a headline on the mailer, along with a photo of a dour-looking O’Malley. 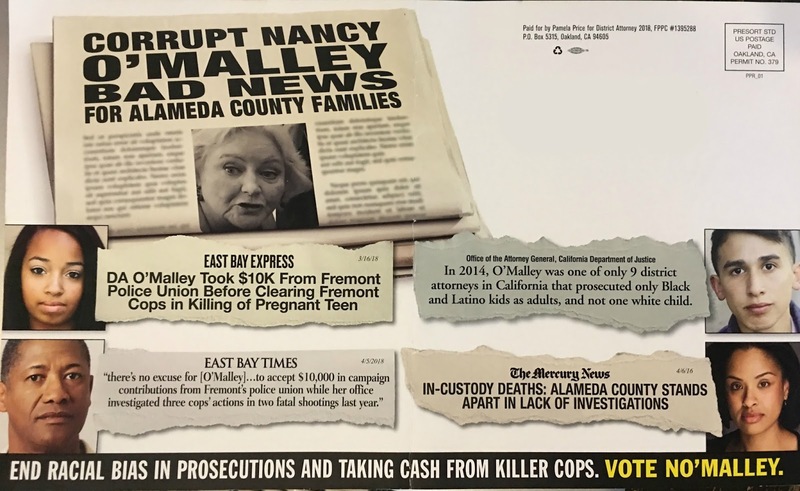 The mailer also includes newspaper headlines that highlight O’Malley receiving a $10,000 contribution last year from the Fremont Police Officers Association while the police union’s president was under investigation by the District Attorney’s Office for his part in the shooting death of a 16-year-old pregnant girl in Hayward. Articles citing O’Malley’s alleged predisposition toward prosecuting underage minorities as adults is also featured in the mailer. “End Racial bias in prosecutions and taking cash from killer cops. Vote No’Malley,” it declares. Many of the mailer’s themes echo Price’s rhetoric on the campaign trail, including an overall call for social justice reform at the D.A.’s office. The full large-size mailer from Pamela Price. But the labeling of O’Malley as corrupt is a ramping up of negative rhetoric in this campaign by Price’s campaign. However, the tenor of this race has noticeably turned sour, if not passive-aggressively, over the past month. At recent candidate forums and endorsement meetings, Price’s incessant attacks on O’Malley is appearing to wear down the incumbent. While O’Malley has rarely lobbed invective back at Price, her facial expressions and body language have revealed clear annoyance with the upstart candidate. Posted in contributions, corrupt, Election 2018, Fremont POA, June primary, mailer, Nancy O'Malley, Pamela Price. Bookmark the permalink.